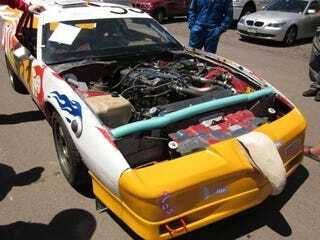 Engine Swap Heroes: Datsun 280ZX Turbo Engine In Pontiac Firebird! The small-block Chevrolet engine has proven to be one of the least reliable engines in 24 Hours of LeMons racing, but there's one that's even worse: the Nissan L28. Some teams see that as a challenge! ...right up until the Kats got involved in an apocalyptic wreck, completely destroying their Nissan. But the L28ET engine survived, and the Kats got to thinking: maybe we should drop the engine in a different kind of car. How about a third-gen GM F-body? Good idea! We're hoping it beats the odds and runs away with the race.